overlap. 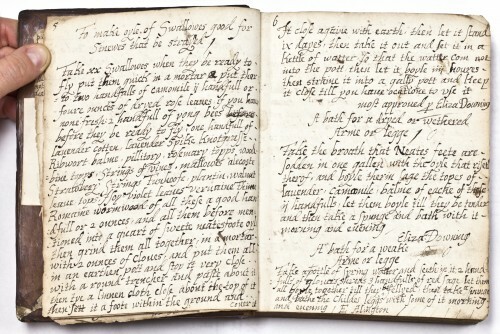 This overlap begins on page 74, where the Layfield hand first appears in the manuscript (with pointedly a gout recipe) and which is shared with a Downing recipe for a the scurvy. The pages then alternate between the Downing hand (pages 75 and 77) and the Layfield hand (76 and 78). The Layfield hand then takes over what had been the Downing portion with 10 pages that include the recipes from Anne Layfield herself. Now there is a lot of room for speculation in our interpretation of this meeting of the hands in the compilation, but it does suggest that some kind of exchange occurred. As has been mentioned before in this series, the manuscript as a whole exists in do-si-do format, and the reversed document starting from the opposite side (pages 241 – 207) is dominated by the Layfield hand. 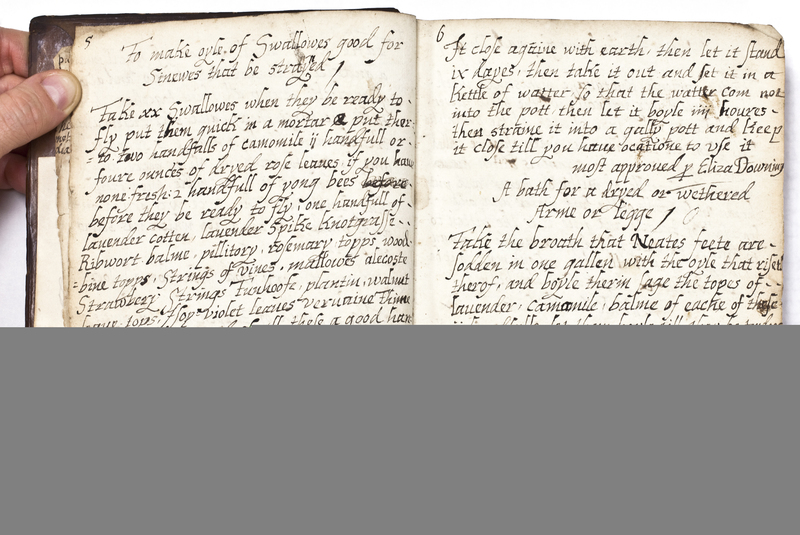 But the page before that section (243) holds a recipe for the ague in the Downing hand reversed from the rest of the recipes in the section. The Downing hand appears again (229–27), in the same direction with the other Layfield recipes; this mini-series includes another recipe for the scurvy. Now whether this overlap indicates anything more than shared scribes is again difficult to determine, but another intersection, the appearance of two attributions, Master Foule and Master Danell, in both in the Downing hand and the Layfield hand suggests that two compilers occupied the same ground, either literally or socially, at some point in the construction of the manuscript. In fact the names of Foule and Dauell (sic) first appear in the Downing hand at 74 and 75, respectively, during the transition into the Layfield section. 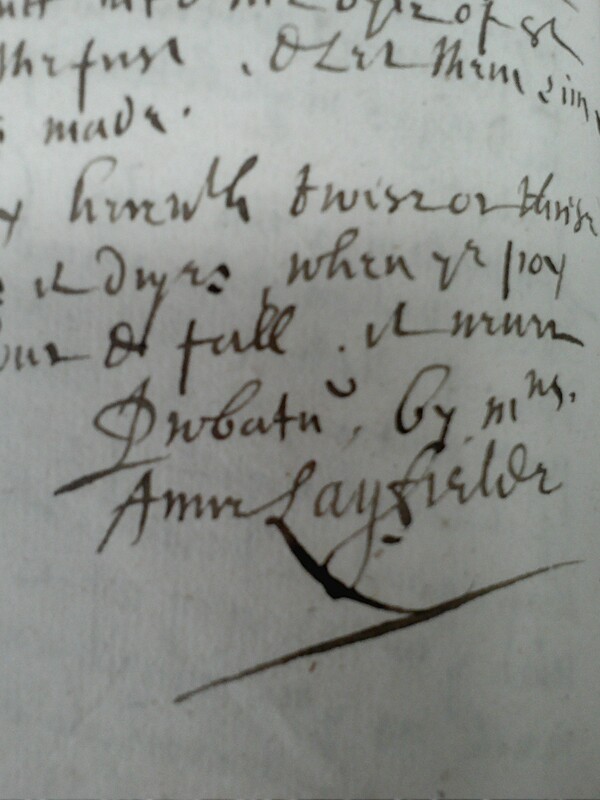 Foule contributes three more recipes to the Downing collection and one to the Layfield section, while Mr. Danell or Danill is given credit for several recipes between pages 213 and 208. The identities of these two gentlemen may remain another of the College of Physicians’ many mysteries, but the further we articulate the overlapping terrain between the two dominant portions of this manuscript, the more cohesive the story it tells becomes. The spelling of Danell as Dauell follows the recurrent interchange between u-s and n-s in the Downing hand.